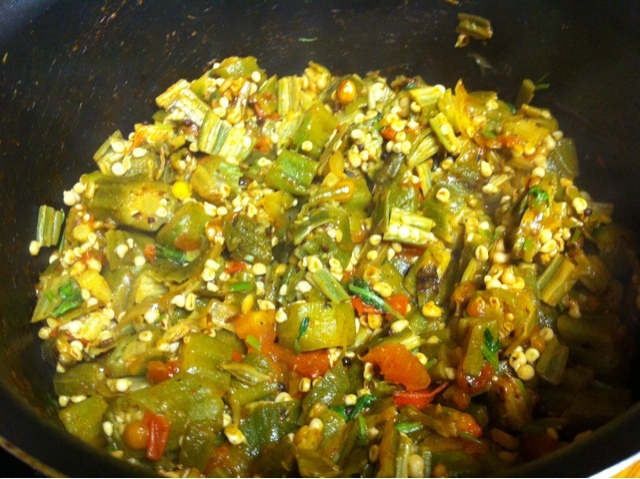 Bhendi or bendakaya or lady's finger or okra call by any name, make any kind of recipe with it my father will like it. When he goes to the market he will bhendi is must in his list of vegetables. I really didn't know that my dad loves bhendi that munch until I got to see one day when he brought bhendi from the Market when it was 40rs. a KG. This simple recipe is dedicated to all the bhendi lovers like my dad. Coming to recipe. For bhendi to be non sticky microwave the pieces for 5min by wrapping the top of the microwave dish with plastic wrap. Heat 2ts of oil in non stick pan and add cumin + mustard + chana + urad dal+ red chili and wait until they splutter. Add onions, Ginger Garlic paste and saute until they the onions become transparent. Add turmeric and cook for few min and add tomato. Mix well and cook till the tomato is completely done. them add microwaved bhendi slices (If you do not have microwave add directly with out cooking but do not stir it continuously. Stir gently making the curry upside down for every 3min.). Mix well. Cook for another 5min and add salt, chili powder and cook for 3min. FInally garnish with cilantro and turnoff the stove. Enjoy this yummy curry with rasam and rice. hope you like my recipe. Perfect veggie curry, looks very delicious. Delicious curry, i can have it with anything.. Delicious curry for both rice & roti..